That evolution can be seen in the above image. The new backstory covering all of the area has the districts blossoming around a spring somewhere in the state of Florida. If you look closely, you can see train tracks constructed and removed, various structures go from a temporary to a permanent look, and the entire area expand into the complex as it may exist in just a few years time. 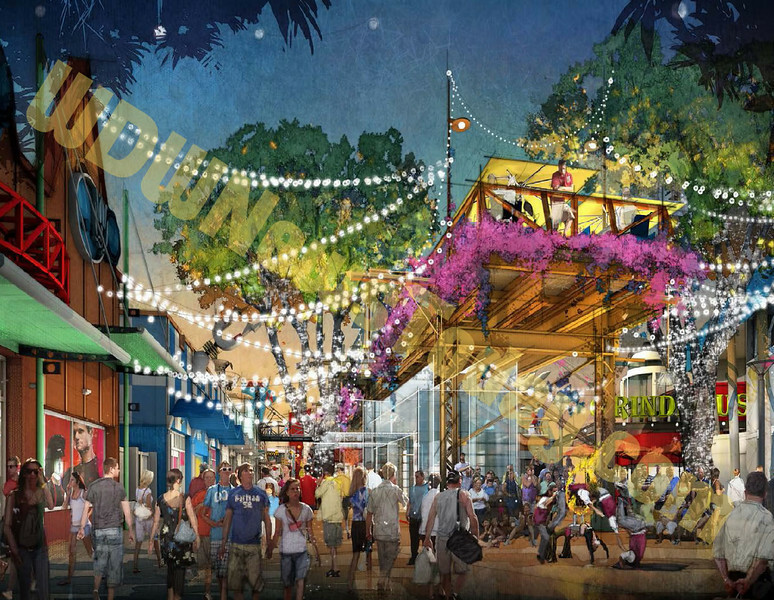 As you can see in the concept art above, the remains of the elevated train tracks will be constructed, possibly offering a second level patio where older guests can drink and dine while they watch shoppers pass on the ground below. 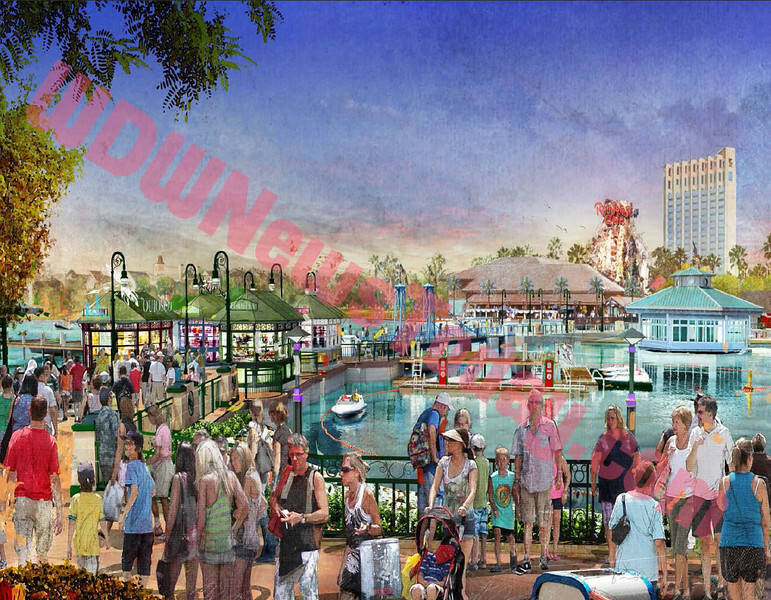 In the concept art above, you can see a new bridge that will connect the two sides of the Marketplace, stretching roughly from where the LEGO Imagination Center is to Rainforest Cafe on the other side. Some elevation artwork for The Village Marketplace section is featured above. 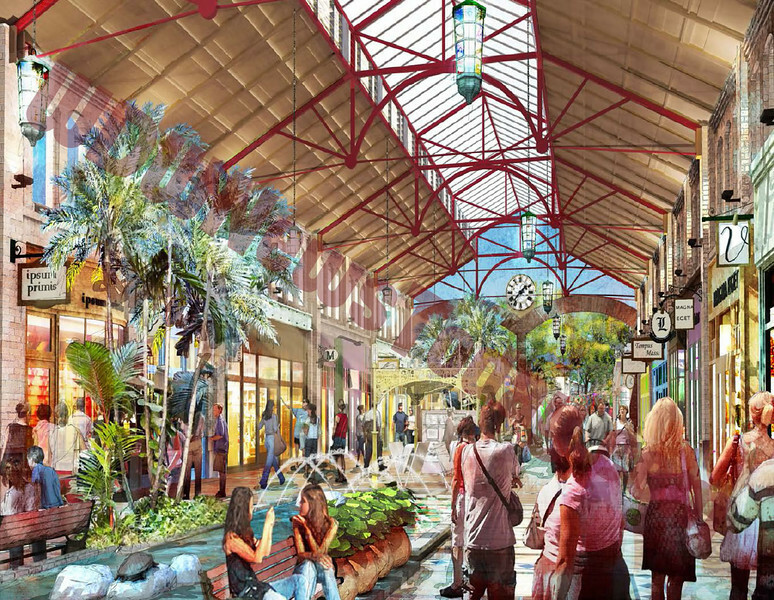 The above concept art depicts the interior of one of the new buildings in this area of “Disney Springs”. Some elevation artwork showcases collections of shops with shrubbery and a large covering between them. A skybridge (overhead walkway) over Buena Vista Drive allows guests to safely cross the street and marks the entrance to “Disney Springs”. 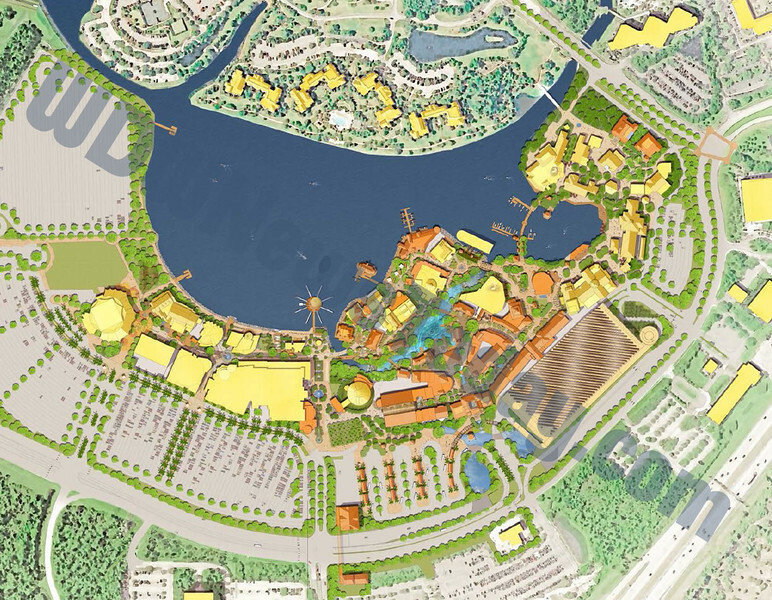 As well, Buena Vista Drive will dive under the car and bus entrances to “Disney Springs”. The Town Center, a new area constructed on what is mostly now a parking lot. The dark orange structures on the map are all new buildings that will be part of the area. Now, as always, it is important to mention that none of this is official. This project may or may not happen (just like Hyperion Wharf, which still never took shape even after an official Disney announcement). 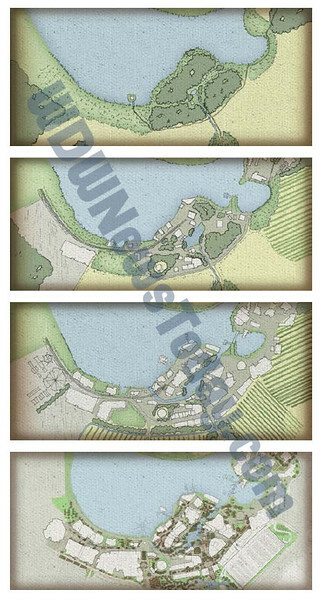 However, according to the documents, this is the current plan for the Downtown Disney area at the Walt Disney World Resort. 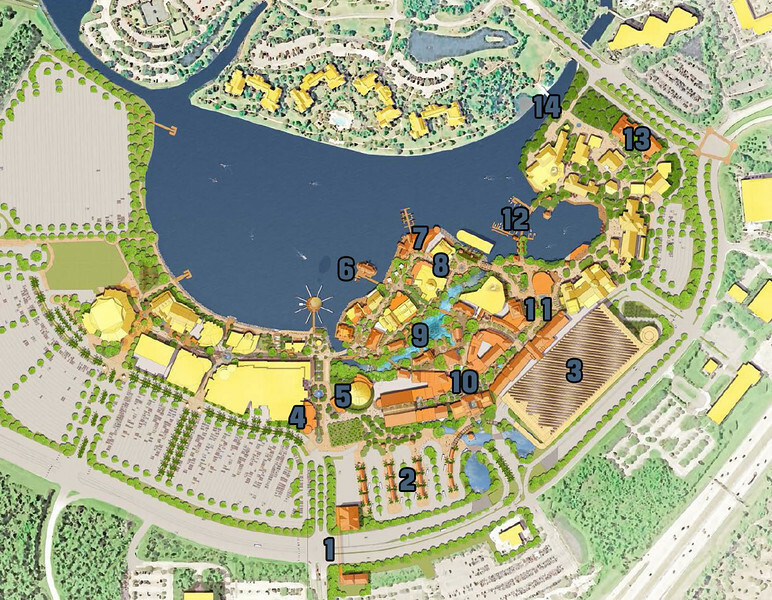 So, what do you think of the plans for “Disney Springs”? 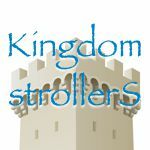 Is this the best way to fix Downtown Disney at Walt Disney World? If they bring back the adventurers club they can do whatever they want! Although it definitely looks nice. I'd be interested to see it finished since im not good at visualizing it on paper. So can we see the PDF? Or just the watermark-plastered pictures? Looks to me like they are trying to make downtown a whole day filler for those people who don't want to waste a ticket entrance ona day when they come into WDW later in the day. If this is how it is gonna be and look I might come in a day before maybe later in the day and go to this place and then be able to rest up before goin into the parks. Am I the only one that thinks that the Town Center looks like the Outlets right outside of the main entrance off of Vineland? Seriously, they look identical! This just strikes me as yet another mall with some flourishes coupled with a place for campfire sing-a-longs and a garden walk. Is this really the best Disney could do? Would love to see the Adventures Club again! That was about the only reason we went to Pleasure Island, nothing like it anywhere. They do need to do something, it is depressing. Told my husband not going back till they "fix" it. Bring back the Adventurers Club and it would be perfect! What Disney does NOT need are more SHOPS and character meet and greets. Pleasure Island was great, anyone who was part of it going away should be beheaded. Too bad Disney doesn't care about guest experience anymore. Is so obviously greedy it's just not fun. Disney cannot redeem themselves here in my humble opinion. Unless Adventurer's Club and Comedy Warehouse come back, I will not be visiting this area. The LAST thing Disney needs is more shopping. They need more places for adults to go and have fun. I would love for them to bring Mad T Party somewhere to Disney in Florida. So many other parks have gotten the greenlight for it, and I heard rumor about it possibly going to DTD back in October, yet nothing has happened. I love it, I actually enjoy strolling through DtD but agree it needs a face lift. Wouldn't mind if they rebuilt DisneyQuest while they're at it. They know a change is needed and they are hopefully commiting to it. I'm excited! Or, they could put fabulous and unique nighttime entertainment in that spot. Something like a themed club full of skilled improvisational actors who entertain and delight the guests as they drink and laugh, having an experience they cannot find anywhere else in the world…..an experience that makes the trip to Florida worth making again and again. Because it really doesn't matter how fancy of a strip mall they build. It's still a strip mall, and it's still not something I would pine for when I'm away. Oh, how I miss the Adventurer's Club. Truly a unique and imaginative experience. It was so enjoyable to get lost in the story of it all. A real shame Disney closed it. I always felt it was a perfect addition to true Disney magic. Definitely looking forward to something being done with the dead zone that was once pleasure island. Do we really need more shopping though? There is already plenty of shopping at Marketplace and West Side. Oh well. Will still be nice to not walk through the PI area getting sad anymore if this happens.